There is chronic discord over the border that has existed between Slovenia and Croatia since independence was declared in 1991. While each country's politicians use aggressive and provocative language against the other country to prove patriotic credentials and demonstrate tough-mindedness in the best interests of the nation, for some parties in Slovenia it is the only issue on which they can get attention. Alternating political cycles guarantee that there is never enough breathing space between elections for both sides to develop more pragmatic positions. Slovenia's PM Jansa has publicly chalked up the more recent assertions from Croatia as unfortunate and clearly meant for domestic political consumption. The last best chance at a bilateral solution was in 2001 when Slovenia's PM Janez Drnovsek and Croatian PM Ivica Racan signed an agreement covering all the outstanding issues. It was rejected by the Croatian Sabor as an unacceptable failure, though it continued to be held up by Slovenia as a workable compromise. In any future negotiation, it was almost certain Slovenia will want to use it as a touch point (though Croatia would reject this proposition) when making the case for its claims. Agreement among the majority of Slovenian political parties, coalition and opposition alike, recognize that arbitration is probably inevitable. By 2007 Slovenia was in the European Union, and Croatia would like to join that club. The Government of Slovenia appeared sincere in wanting Croatia and the rest of the Western Balkan countries to join the EU. This was key to its policy to create a secure and stable Balkan region. From the Prime Minister to the head of the Parliamentary EU Committee, to the Foreign Minster himself, all say that Slovenia would not hold Croatia's EU accession hostage to bilateral issues unless the EU was interested in having these problems solved prior to Croatia's entry. By 2007 it seemed that relations might be on an upswing on the Croatia-Slovenia dispute. Foreign Minister Rupel had largely stepped back from public confrontation. This was to the relief of many Slovenes of various political views who found his personalization of the dispute and high handed threats about EU accession for Croatia to be poor form and detrimental to an important bilateral relationship. However, for calm to rule, it was clear both sides must observe restraint when it comes to public discussion of the border by government officials. Politicians and the Press were much harder to rein in. Slovenian Foreign Minister Rupel stepped back into the annual summer border dispute between Croatia and Slovenia after the unveiling in Croatia on 21 May 2007 of a map of traditional shellfish farms in the Bay of Piran. The map, produced by the Ministry of Agriculture in Croatia, provoked this reaction with the depiction of a line of demarcation running through the middle of Piran Bay, which on this map is identified as Savudrija Bay - another affront. Rupel stated the Government of Slovenia is serious about respecting the "non-provocation pact" agreed between the GOS and GOC in June 2005 and that "no other maps but those that reflect the situation as it was on 25 June 1991 can be valid." In his same-day reaction Rupel told a news conference that no map drawn after June 25, 1991 had any validity, and that sooner or later Croatia would have to find a way to solve this issue, since it hoped to join the European Union. 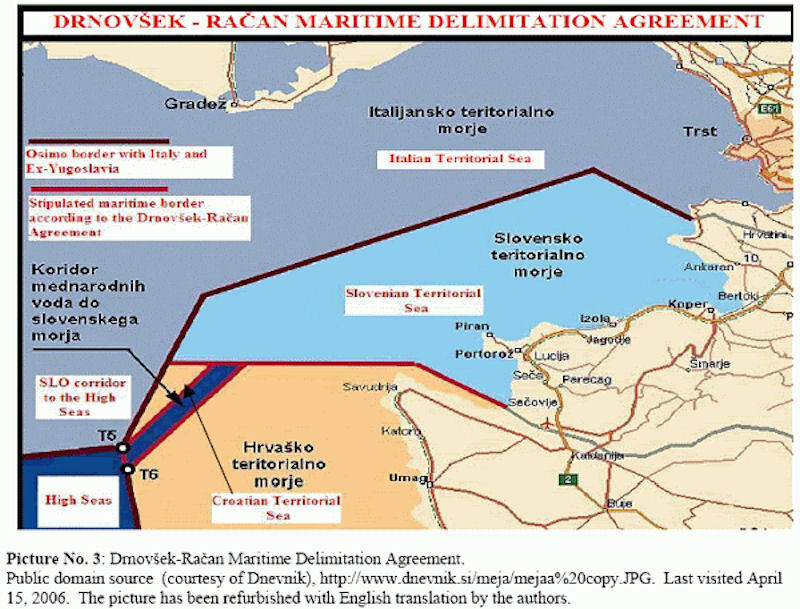 Rupel did not dispute the location of the farms, rather he objected to the depiction of the Slovenia-Croatia border running through the middle of Piran Bay and the assertion that Croatia would have jurisdiction over that area. A further provocation was the renaming of the bay as Savudrija Bay after the nearest Croatian town and which, is a name that has never been used to describe this area of water. There was continuing provocation from Slovenia. It came, predictably, from loud mouths in minor political parties who had few other issues on which to build their national profiles. The assertion by Zmago Jelincic of the National Party (SNS) that Slovenia's border should extend to the Mirna River - well into Croatian Istria - was dismissed by all as absurd, and his further threat to call for a referendum on Croatia's EU accession was considered reckless and a recipe for certain disaster. Marjan Podobnik (SLS), a minor politician (but from a coalition party) and head of newly formed "Institute 25 June" released a map of his view of the Croatia-Slovenia border on 114 May 2007, and he was rebuked by Rupel in the same press conference in which he reacted to the Croatia map. This latest cycle of accusations and recriminations failed again to produce any substantive change in the situation. Prior to this most recent dust-up, Croatian Ambassador to Slovenia, Mario Nobilo, had expressed optimism that the rhetoric had died down and that there was an opportunity to start the process of arbitration prior to the EU Presidency. The looming EU Presidency does seem to be the impetus for the GOS to resolve a few outstanding issues that many believe will reflect poorly on the GOS if left at loose ends during the Presidency. These include managing a real reduction of court case backlogs, resettlement of a well known Roma family, and possibly resolving the status of the "erased." The two sides, both former Yugoslav republics that are now EU and NATO member states, agreed in 2009 to send the case to the court at The Hague. Slovenian PM Pahor and Croatian PM Kosor announced in Ljubljana on 11 September 2009 an agreement to resume talks on their border dispute and to remove Slovenia's hold on Croatia's EU accession negotiations. The signing of the historic border arbitration agreement 04 November 2009 by the Prime Ministers of Slovenia and Croatia was just the first step in a complex domestic process that challenged Prime Minister Pahor and his government as they seek ratification of the politically sensitive agreement. The PM's greatest challenge came from opposition leader Janez Jansa, who saw the agreement as flawed and Pahor as politically vulnerable. The Parties agreed, in the Arbitration Agreement, that the boundary should be determined in accordance with international law. The Tribunal is thus required to decide the matter from the legal, and not from the historical or political or sociological perspective. the Parties agree that there had been no formal division of the Bay between the two Republics prior to the dissolution of Yugoslavia, and that neither State inherited legal title from that time. The Tribunal's task under Article 3(1)(b) of the Arbitration Agreement was the determination of “Slovenia’s junction to the High Sea”. 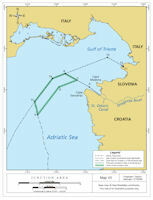 The Parties were deeply divided over the question of whether the reference to a “junction” in the Arbitration Agreement signified that Slovenia’s maritime zones must abut and have a boundary with an area of high seas (as Slovenia maintained) or whether a “junction” requires, not physical contiguity, but only that there should be secure and uninterrupted access between the high seas and Slovenia’s maritime zones (as Croatia maintained). Following a first procedural meeting on 13 April 2012, Croatia and Slovenia exchanged three rounds of extensive written submissions, which were accompanied by over two thousand documentary exhibits and maps. From 2 to 13 June 2014, a hearing was held at the Peace Palace, in the course of which both Parties presented their positions. 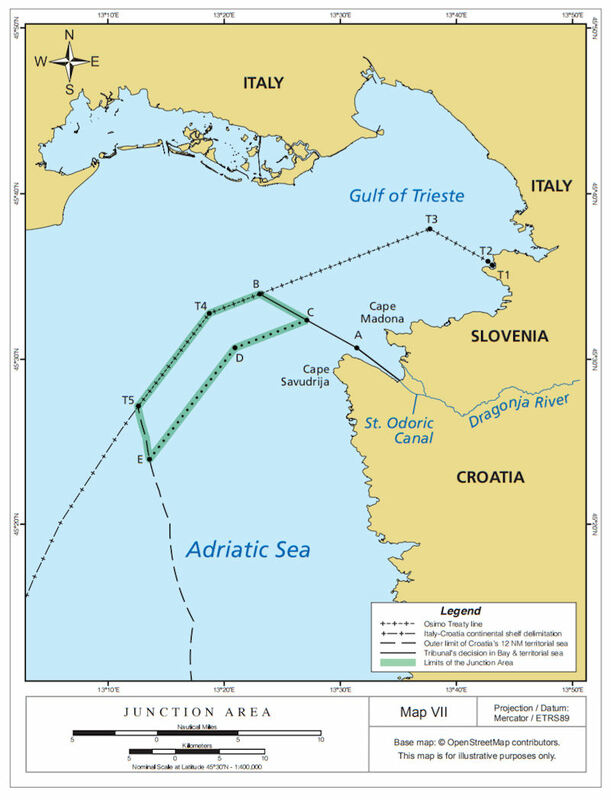 On June 29, 2017 the international arbitration court handed Slovenia a victory in its long-standing border dispute with Croatia, awarding it direct access to international waters in the Adriatic Sea in a decision Zagreb says it will not honor. 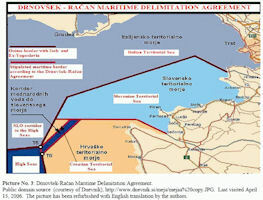 The Hague-based Permanent Court of Arbitration on June 29 ruled that Slovenia should have "uninterrupted access" to the sea in the dispute over 13 square kilometers comprising the Bay of Piran and a stretch of mainly uninhabited territory. Slovenian Prime Minister Miro Cerar called the ruling an "historic moment for Slovenia," adding that the judgment "is definitive and must be applied on both countries, Slovenia and Croatia." However, Croatian Prime Minister Andrej Plenkovic said Zagreb will refuse to implement the ruling, despite having originally agreed to take the matter to arbitration. "Today's arbitration decision for Croatia is a decision which is not obliging us in any way.... nor do we intend to implement its content," Plenkovic told reporters.